The alarms are sounding about sitting disease. Sitting for long hours on the job and at home raises your risk of illness and obesity and may shorten your life. The Wobble Stool by Uncaged Ergonomics aims to change sitting time into active time. Rather than sitting still, on the Wobble Stool you are always engaging changing combinations of the leg, hip, and ab core muscles. It moves with you — you can tilt as far as you can manage and it is still stable. You can swivel 360 degrees. The rounded base where the Wobble Stool meets the floor is what provides both the wobble and the stability. 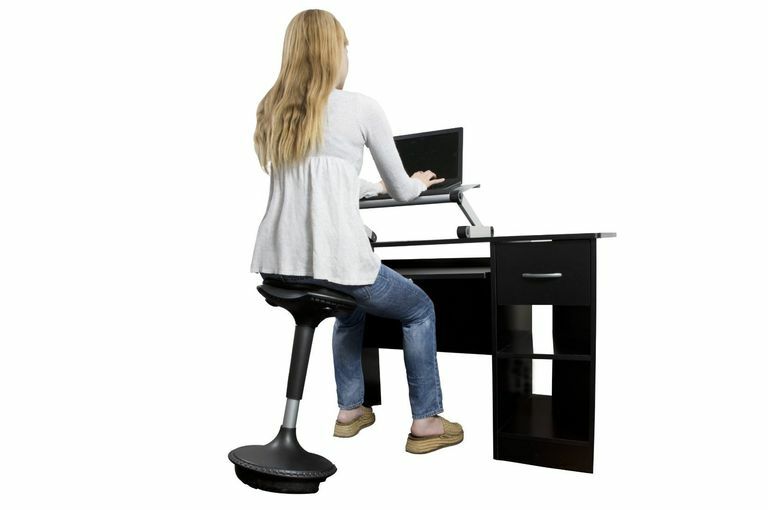 It allows you rock back and tilt, yet its weight and curvature allow the stool to return to upright position. It has a non-skid cover which they say provides traction on any surface. The drawback would be that you can't wheel it around as you may be used to with a desk chair. The advantage is that is one more incentive for you to get up and walk around more frequently. The height adjusts from 23 inches to 33 inches with a push button on the bottom of the seat. I found the lowest height to be higher than I am used to using at my desk. But because I am short, that meant more muscle engagement with my quads. I found myself sitting at a slight angle and engaging my muscles rather than sitting inert. The triangular seat is 13 inches in diameter. The cut-out shapes of the triangle allow ease of leg movement as you tilt, rock or swivel. The seat is padded, and they note that they have added extra padding. That is good as I, and other reviewers found that it could use more padding. Sitting for 15 minutes, I was ready to change to standing or find a different chair. Some solved that by adding their own extra padding. The seat comes in blue, black and red. Health experts are more and more encouraging us to use standing desks or treadmill desks. But you may not be able to modify your office environment with those options. They also can be expensive, although Wobble Stool's manufacturer, Uncaged Ergonomics, has some ingenious solutions for those, too. The Wobble Stool would fit into most office environments without looking odd. The cost is less than most ergonomic desk chairs, standing desks, and treadmill desks. Other active sitting solutions include sitting on a fitness ball. While that has become a common option, it still may look odd in your business environment. I often use a fitness disk as a seat cushion to get a little active engagement, but some people may wonder if you have hemorrhoids. The Wobble Stool can also be used at home as a bar stool at your kitchen counter or table, or for use when using your home computer, gaming or watching video and TV. While it's possible to tilt too much and fall off the Wobble Stool or over-extend your back, I felt like I had less risk of that compared to a fitness ball chair. The designers make no health claims about the Wobble Stool. I haven't encountered studies that compare the health risks for people who use active sitting (such as on a fitness ball) with inactive sitting, so we don't know whether it makes a difference. The biggest reason I didn't adopt it completely was that I couldn't use it with my DeskCycle under-desk cycle exerciser, which I use for 10-15 minutes every hour at work. I need its exercise for my knee health as an offset to my walking workouts. It keeps my Nike+ FuelBand happy that I am meeting my activity goals throughout the day while sitting on the Wobble Stool does not. I thought the Wobble Stool was a good alternative to using a fitness ball as a desk chair and I felt it gave me much more muscle engagement than sitting on a fitness disk. I thought it lacked cushioning for comfortable sitting for a long time. While we are encouraged to get up and move more, you may not be able to do that in your work environment.